Sometimes the label “based on a true story” can help give a movie it’s sense of realism, it’s sense of drama and make the experience much more engrossing as you realise that people had to live through the events of a film. In the case of Pain & Gain, the label “based on a true story,” something the movie refuses to let you forget, is used because the story is so ridiculous that you’d be forgiven for wondering if anything like this could happen at all. This is because the three principle characters, who drive the story along, are incredibly (and hilariously) stupid. They decide that to make themselves rich quick, they will kidnap, extort and then hopefully dump unaware, a rich business man. As you can expect from any type of movie like this, the plan goes awry quickly and begins to escalate beyond the control of our hapless criminals. The movie does go from ridiculous moment to ridiculous moment and this is why being a “true story” is so important. What you would usually dismiss as a farcical comedy becomes one of extreme hilarity as murder attempts go wrong, deals get violently dodgy and the three characters become more and more desperate. Those three characters are played brilliantly by three very different but very complimentary actors. Mark Wahlberg is the man with the initial plan. He is the “brains” of the operation but this says very little. It is refreshing to see Wahlberg play a role in which he gets to stretch his comedic talents rather than his overly dramatic or action-focused ones. Along those same lines is a very different performance from Dwayne Johnson. He is a muscle-bound beefcake but one who is devout Christian, cocaine-addicted and ultra-violent. This makes for some vast departures from the usual Johnson roles, where we see him play to his comedic-talents in full, successful glory. 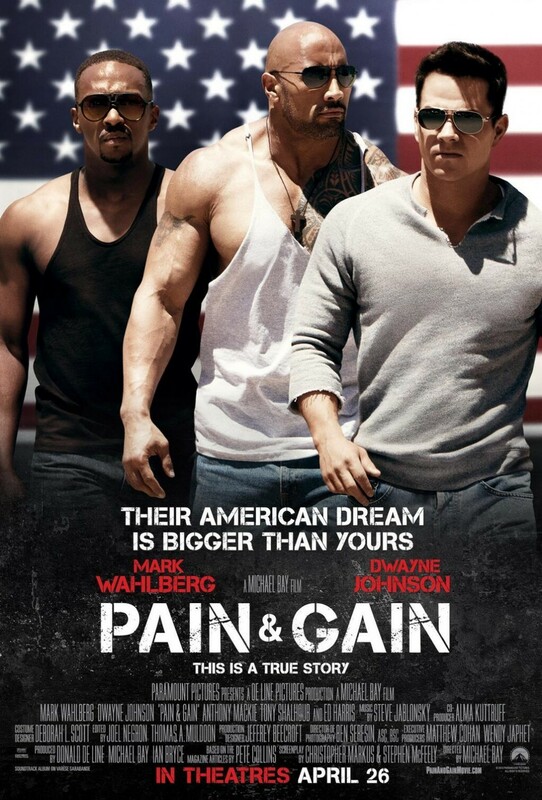 Pain & Gain seems to bring some of the best out of Johnson. 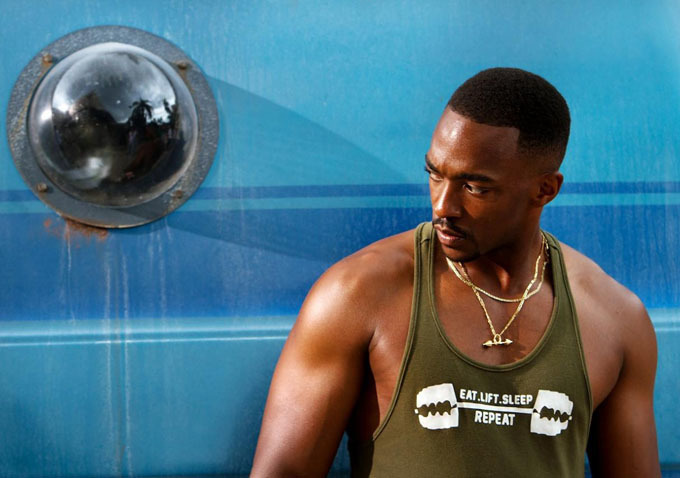 Avengers alumni Anthony Mackie rounds out the trio. He is just as stupid, just as crazed and clearly as violent. The trio have some great chemistry between them and are the reason the movie is hugely watchable. It takes what can be a very violent and at times extremely dark premise (particularly when you remember that it is true) and adds the required black-comedy which is necessary for it’s success. Which is why it is very surprising that this has come from Transformers director Michael Bay. Pain & Gain feels much more like “classic-Bay” rather than the mindless, story-less action-fare director that he has become. This is a well-told, impressively shot and humoured take on a ridiculous story which could have resulted in being too serious or too silly if not balanced well. Bay shows that he still has some of the talents that saw him propel to Hollywood elite, even if he seems to wasting them on a dying pet project today. That doesn’t make Pain & Gain perfect however. As true as the story may be, it still stretches it’s credibility thin. It is a plot which builds and builds and develops and develops until it hits the roadblock which is the ending. It feels too secure and safe in the way it ends and wraps itself-up, leaving you wondering if there could have been more to the trio’s story. Overall, Pain & Gain is a bizarre true story which will make you wince, laugh and shake your head in disbelief. It showcases the talents of Wahlberg, Johnson and Mackie, while also highlighting that when we wants to, Bay can still produce a film with some credibility. 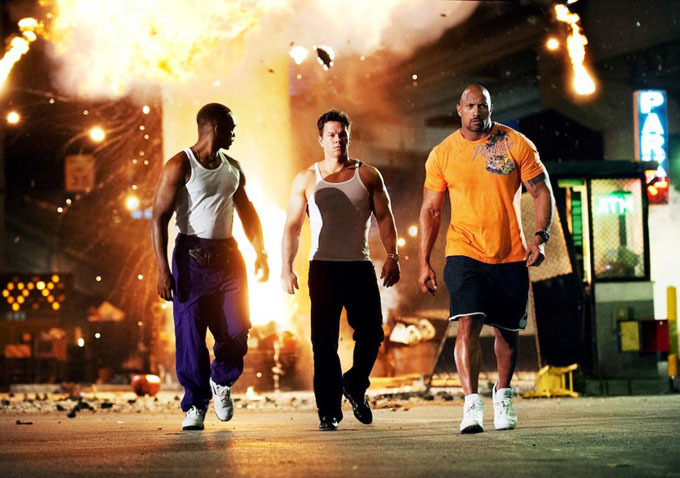 A far too neat ending aside, Pain & Gain is well worth a watch.